Good old fashioned dirt can do a lot of harm when it builds up in a high efficiency furnace ( or in any other furnace). It can lower operating efficiency and waste fuel. If it gets bad enough it may even cause overheating of the furnace. 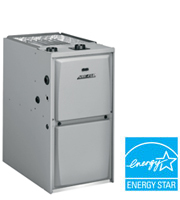 Your high efficiency furnace needs to be regularly maintained to keep its efficiency as high as possible. Cleaning the furnace is important during regular maintenance. The fan, the motor and the air filter should all be cleaned regularly as needed. The air filter needs to be replaced at the start of every heating season, and again replaced or cleaned monthly during the period of time the furnace is in use. Remove the air filter and examine it. If it is full of dust and dirt it should be replaced with a new compatible filter of the correct size. The air filter is a glass fiber meshing framed in cardboard with the size printed clearly on it. The arrow on the frame indicates the direction that air flows in passing through the filter. Air comes from the return-air duct to the fan, and the arrow should point toward the fan and away from the duct.. Permanent filters should be cleaned and sprayed with the special chemical material sold for the purpose at home centers. The permament filter is cleaned as specified by the manufacturer's instructions which are usually on a label on the furnace. To replace a filter: open the metal door under the return-air duct. It is often marked "filter," or may be just a lid on your furnace housing. Remove the filter.This is done in different ways on various models of furnace but will be fairly obvious usually. Check and clean or replace the filter as required. Next you should clean the fan, the belts and the pulleys to the fan and motor. Cleaning the fan properly is very important since some types of fan can become badly clogged with dirt. To clean the fan, remove the panel on the furnace. This panel may be attached with screws or can be a slip off type. The fan unit can usually be slid out on its track. After thorough cleaning reassemble the unit and the furnace is ready to go again. For more information about high efficiency furnaces see our website.Or go to high efficiency furnaces for further details. The quality of air filter for your furnace is a very important aspect of your heating system, and hopefully you want the best grade filter as it directly impacts the air you are breathing in your home.